Happy Thursday! Today I am sharing with you how to make a Crispy Chickpea and Kale Salad. I also like to call this a Harvest Salad because it contains butternut squash and carrots. Plus the roasted chickpeas add a warm fall-like feel to this nourishing meal. If you have never made roasted chickpeas before once you do you will fall in love! Not only are they great as a salad topping they are also great to munch on as a snack. Think of them as the new and improved crouton! I can’t wait for you to watch today’s Healthy Grocery Girl Show episode to see how I make this dish! You can also get the recipe below. Also known as a Harvest Salad, this Fall meal that is delicious and filling! Drain and rinse garbanzo beans and place on a baking sheet. Add frozen butternut squash and tri-color carrots. Drizzle with coconut oil and sea salt. Use hands if necessary to “toss” all ingredients to make sure coconut oil is evenly covering all beans and veggies. Roast in the oven for 20-25 minutes. Meanwhile, wash and devein kale by "zipping" the leaves off of the vine. 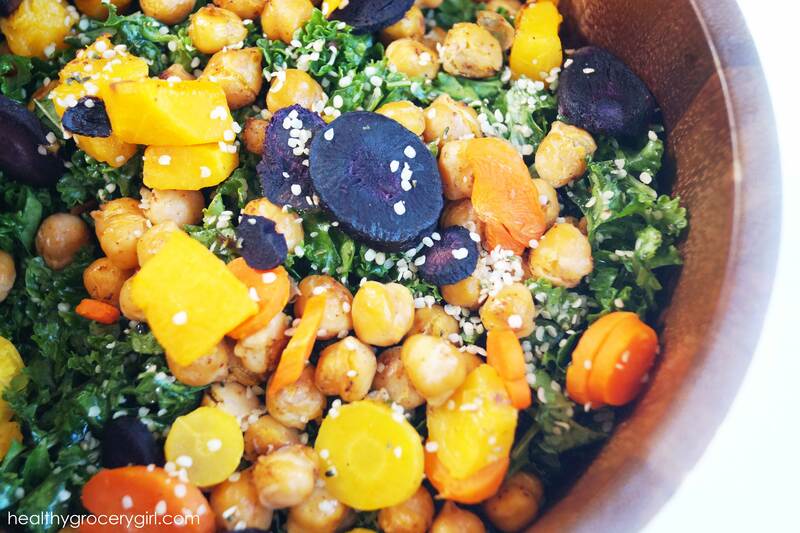 Chop kale and add to a medium bowl. Drizzle with olive oil and sea salt and massage the kale until it is evenly covered with dressing. When beans and veggies are finished roasting, add on top of kale salad and sprinkle with hemp seeds.